The project managers will accept your data for the foreseeable future so don't hesitate to get involved still. Dr. Kunio M. Sayanagi, Ph.D., Associate Professor of Planetary Science Department of Atmospheric and Planetary Sciences Hampton University has a research project to image Jupiter in an effort to detect asteroid impacts. He is wanting to capture and analyze 250 hours of Jupiter imagery of sufficient resolution to be able to detect an asteroid impact. An impact typically lasts for about 1 second and analyzing several sequenced images will sufficient resolution will reveal it. Impacts can be detected with amateur grade telescopes and cameras, thus with the right tools anyone can contribute to this research project. All imagery will be accepted! You do NOT have to be a member of our club to participate. Jupiter will be back in early 2018 and available to be imaged from March through July. While any video (high speed images) can be used and will be accepted for analysis there are some parameters that will enhance the odds of capturing an impact and be able to detect it using the impact detection software. 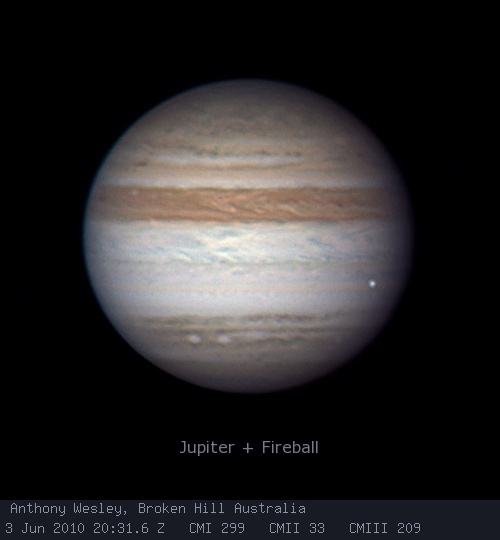 If you have done any Jupiter imaging so far let Ben Loyola know so he can forward the files or link to Dr. Kunio M. Sayanagi PH.D, Associate Professor of Planetary Science, Hampton University for his impact detection project. We have also been asked to forward video to the Planetary Virtual Observatory and Laboratory which also has an impact detection software DeTeCt: Planetary Virtual Observatory and Laboratory Website. The bright, two-second flareup appears near Jupiter's left (celestial west) limb in this frame from a video that Anthony Wesley was recording at 20:31:29 UT June 3, 2010. Barlow Magnification = 825 * camera pixel size in microns / telescope focal length. - Just insert the Barlow on your telescope, then the camera into the Barlow. - For the capture session, get your telescope out for at least 30 minutes to get it equalized with the outside temperature. - Use a regular eyepiece if that is easier and get a decent 2-star or polar alignment depending on your mount. - If your camera comes with driver and capture software follow the "Read Me" instructions and install both. Once you connect the camera via USB and run the software you should be able to connect to the camera. - With your software running, adjust the exposure and gain to see stars by adjusting the focus. Then move to a bright star near Jupiter. There take your time to get your focus as best you can then move the scope to Jupiter. Due to atmospherics Jupiter will still look a bit out of focus but if you got a good star focus you will be fine. - Your alignment will drift over time, not to worry, just use your manual or electronic controller to keep it centered as best you can. An occasional move will not hurt your data capturing several frames per second. - Adjust the gain and exposure time as to not saturate Jupiter. Should be bright enough to see the bands especially when it captures an occasional good still (not so disturbed by atmospherics) image. - Your camera should save the images as an AVI or SER video file or sequentially numbered JPG images. Run a short capture then go to your default folder and check to make sure all is working. If all looks good, run the capture for as long as you can. You can break it up in to blocks of several minutes. - Imaging through thin clouds, haze, and near the Moon shouldn't be an issue and there is still plenty of good data captured. The impact detection software is much more forgiving than regular astrophotography. - Once you have the data, you will upload it to the folder Dr. Kunio Sayanagi has created and can run the DeTeCt software locally and forward the report. - There are plenty of YouTube videos out there that will walk you through all of this in more detail depending on the camera and mount you have. - If you have any issues you can utilize our club's Yahoo Group for further guidance. Clear skies. Oversampling Seeing– The atmosphere that you see and image through is turbulent. In order to capture sufficient detail it is recommended to oversample by imaging at 3 times the seeing conditions. With a good night of seeing rated at 1.5 arc-seconds that gives a target of 1.5 / 3 = 0.5 arc-seconds. Image at least 0.50 arc-seconds per pixel due to seeing conditions. Image at 30+ FPS is a good target. Resolving Power is all about the Aperture and we all know Aperture rules and getting the biggest Light Bucket you can is a motto in the astronomy community. Here is why; Resolving Power has to do with the diffraction of light as it enters your telescope. The opening edge causes interference light waves to be created that prevents a point of light from coming in to perfect focus. Instead it produces a pattern called an Airy Disk which has several rings around the central image. This blurring limits the fine Resolving Power of a telescope. Oversampling the images at 2 times the Resolving Power of your telescope is the recommendation. The Resolving Power (arc-seconds) = 120 / Telescope Aperture (mm). 4” Telescope = 102mm Aperture	Resolving power = 120 / 102 = 1.17 arc-seconds. 2 times over sampling the Resolving Power would suggest a camera that would produce an image scale of 0.58 arc-seconds per pixel. This is right in line with the 3 times oversampling during good seeing conditions of 0.50 arc-seconds. Thus a 4” telescope would be at the lower limit for what we are trying to do for this project. Smaller than a 4” would limit your imaging due to aperture, even if you had excellent seeing conditions. The image scale is the angular dimension that each pixel on the camera sensor captures. This scale is depended on the width of each pixel on the camera sensor in microns and the focal length of the telescope. It will be the determining factor on how much resolution you will be able to capture. So now let’s take a look at the camera. You can pick up a ZWO ASI120MC (color) USB-2 camera ($169.00). It can capture over 100 Frames per Second with a Region of Interest of 640x480 pixels. At this high FPS, this camera has great stopping power during steady seeing. 3.75 um pixel / 1325mm Focal length * 206.265 = 0.58 arc-seconds per pixel. This configuration will work but could benefit with a 2X magnifying Barlow ($50) providing 0.29 arc-sec/pixel (0.58 / 2) producing a 156 pixel wide (78 x 2) image of Jupiter. 2.4 um / 1325mm Focal Length * 206.265 = 0.37 arc-seconds per pixel for a 121 pixel image. Resolving Power = 120 / 280 = 0.42 and 2X oversampling = 0.21 arc-second per pixel. Image Scale = 3.75um / 2800mm * 206.265 = 0.28 arc-seconds per pixel. Pro-Amateur Astronomers routinely image around 0.20 arc-seconds per pixel. They tend to use larger 14” telescopes (2 times oversample = 0.17 arc-sec) and image in locations that provide great 1 arc-second seeing conditions (3 times oversample =0 .33 arc-sec). You can see how these two factors form book ends to what you can best do depending on your scope and seeing conditions and ultimately drive the camera selection. There are many image capture software available to interface with and control cameras. FireCapture is highly recommended. It saves the images in a SER or AVI video format. SER format is the preferred format. Make sure you activate the log function as it is read by DeTeCt impact detection software to get the maximum timing information. If you are using a Canon DSLR camera, use the Live View as it captures at 1:1 pixel resolution at 5-10x magnification. I have found the 10X works best. A software package that interfaces with DSLRs like Astro Photography Tool or BackyardEOS saves the images as a JPG in a sequential numbering format. A simple USB webcam will create an AVI video file and a cell phone will create a MPEG video file. The good news is that all of these image formats are acceptable for the impact detection software and even a 4 inch telescope with an inexpensive WebCam in average seeing conditions will provide research grade data and a chance to capture an elusive Jupiter asteroid impact! First in general: The usual imaging acquisition setup is fine, when you run DeTeCt afterwards on the videos. This way gives you minimum additional work: you go out for imaging normally, and just run DeTeCt on them afterwards, checking the generated detection images generated (*_dtc_max.jpg images) in search for a possible impact. If something is suspect, please contact me and send me the detection images and the DeTeCt.log. If nothing is suspect, please send me the DeTeCt.log nonetheless, non-detection are very important for the project. 1) Mono or color, is one any better than the other? Both mono or color camera are fine, even if nowadays the best (sensitive) planetary camera is mono. 2) Ideal CCD imaging scale (arc-seconds/pixel)? The one you use for imaging is fine as it will then give good resolution on the potential location of an impact. For an example with my 12.5 inches I image at 0.11 arcesc/pixel. 3) Minimum A to D converter bits, 8, 10, 12, 14, or 16? 8 bits is enough for planetary imaging. 4) Minimum frames per second? It would be good to have at least 20 frames/second: in case of a flash detected, then the lightcurve we could construct from the original video would have enough resolution. 5) Are all of the frames submitted or just the best X%? You do not submit the frames - just the DeTeCt.log, and possibly the jpg images generated by DeTeCt. This software will analyze the whole videos. 6) No-filter or filter (Red, Dark Red, IR, or IR-Band Pass) to improve sharpness and contrast? The impacts are possibly more contrasted when Jupiter is darker, for example with a blue filter or a methane absorption band filter. But again process *all* of your videos. 7) Best image or video file format to use? Ser file format is a standard nowadays and is fine. Please activate the log function of your acquisition software (eg FireCapture) as it is read by DeTeCt to get the maximum of timing information, which is important for the videos without impacts. 8) Imaging camera manufacturer and model that you have seen that has worked best? Impacts have been detected even with old Philipps TouCam Pro II... so any one will work, but the more sensitive, the less read noise is better. ASI290MM for that is great.